Whether you roll or tamp the soil of a new lawn depends on whether you are planting a new lawn or if you are laying sod for a new lawn. You roll soil to prepare it for planting seed or laying sod; you lightly roll a newly planted lawn, and either roll or tamp newly laid sod. The drums of lawn rollers are from 24 to 36 inches wide; when they are filled with water, they can weigh up to 400 pounds. You add or drain water to gain or reduce the weight, depending on the chore. You can push or pull smaller models used to plant lawns or lay sod. Lawn or garden tractors pull heavy rollers to smooth bumps and high spots on mature lawns. Lawn tampers are usually have a square, flat metal surface at the bottom of a wooden handle that is generally 45 inches long. The metal tamp at the bottom usually weighs about 12 pounds. The weight and measurements vary with the model of the tamper. After you rake and level the soil for planting, you should pack it firmly with a roller before you sow the seed. This gives a smooth surface for the newly planted lawn. Rolling the soil before you lay the sod gives the soil a firm base for the strips of grass that you will put in place. Fill a roller 1/3 full of water, and roll the soil until your footprints are no more than ½-inch deep. You roll newly laid sod to make sure the roots have good contact with the soil and to level footprints and dips on the surface. You should use a roller that is 1/3 full of water. If your roller is too heavy, it can cause the sod to slip. 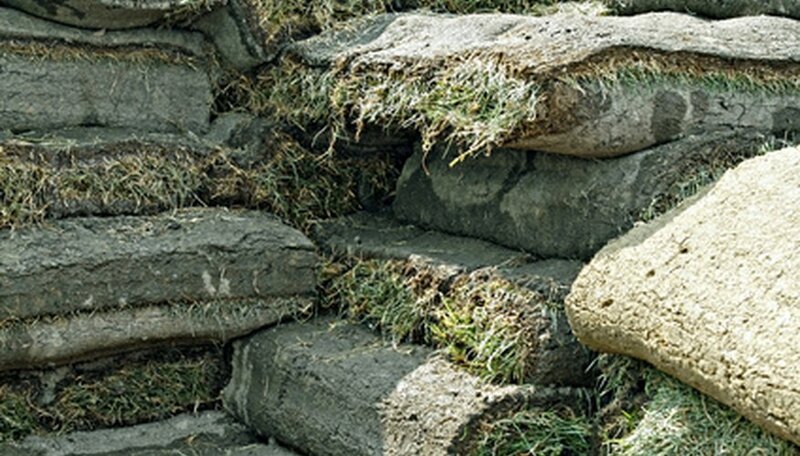 If the weather is hot, water the sod lightly before you roll it; this also is done to prevent the sod from slipping. If you do not have a roller, you can use a tamping tool on newly laid sod. The difference is that you roll newly laid sod after the entire lawn is in place; whereas you tamp the sod as you lay each piece so that you do not walk over recently laid and tamped sod. A good procedure is to have one person to lay the sod and another to tamp it. After you sow seed for a new lawn, you should ensure that the seed has good contact with the soil. You do this by rolling it lightly with an empty roller. Northscaping recommends that you roll the newly seeded lawn twice; roll north to south and then from east to west. Water the lawn lightly after you finish rolling the seed.